Download PC / Police Constables CIVIL PMT/PET Call Letter AP Police PMT, PET Schedule, Call letters for Police Constables SI, RSI, Jailors, Station Fire Officers 2019 . Download the Call Letter for PMT, PET and Verification of Certificates for the posts of SCT PCs Civil & AR (Men & Women) and APSP (Men), Warder (Men & Women) & Firemen SLPRB AP Police Constables , SI Posts PMT/PET Hall Tickets 2018. SLPRB AP SCT Police Constables (Communications) Recruitment 2019-PMT/PET Hall Tickets @ http://slprb.ap.gov.in/ AP Police Communication Constable PMT/PET Hall Tickets 2019. Andhra Pradesh State Level Police Recruitment Board (APSLPRB) released Stipendiary Cadet Trainee (SCT) Communication Constables (Men & Women) Examination Hall Tickets 2019. Candidates are waiting for this hall tickets. All the required candidates can check and download from this page. AP Police PMT, PET Schedule for Police Constables, SI, RSI, Deputy Jailors, Station Fire Officers 2019: State Level Police Recruitment Board, Andhra Pradesh published the AP Police Recruitment notification on December 01, 2018 to fill the posts of SI, RSI, Deputy Jailors, Station Fire Officers. The Preliminary Written Test for the above posts was held on 16-12-2018 at 7 locations, in which 51.926 candidates qualified. The PMT & PET for these qualified candidates will be held in 4 locations i.e. at Visakhapatnam, Eluru, Guntur and Kurnool as per schedule. 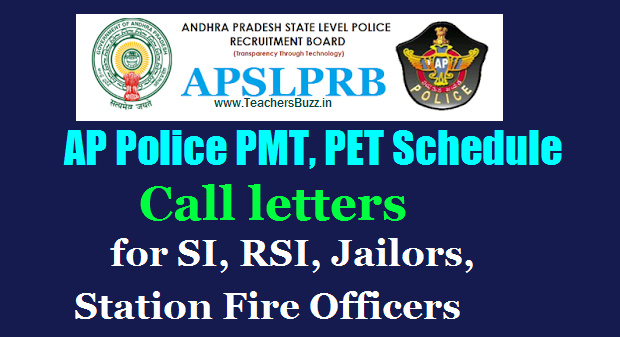 AP Police Constables, SI, RSI, Jailors, Station Fire Officers Call letters: The call Letter for PMT/PET can be downloaded from from website “slprb.ap.gov.in”.